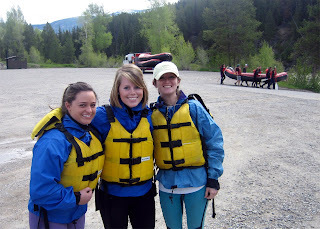 Yesterday on my day off Sarah, Stephanie and I decided to go rafting down the Snake River. 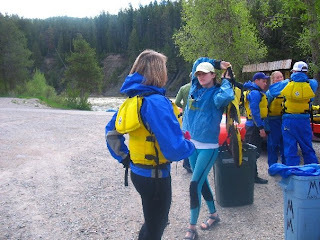 We went with Lewis and Clark White Water Rafting Company, and for locals it is only a $1.00. Pretty good deal we thought! The water was cold and at first we weren't going to wear wetsuits, but one of the guys told us that we would be the first this season to not use them and water was really cold, so we rented them. A part of me is glad, but I thought I would have been fine without the uncomfortable suit. It was alot of fun and I was able to see my friend Jason who is a guide for Dave Hansen and Joe who is the shuttle driver. They told me next time I could go for free if I went with them. I'm not going to pass up that opportunity. 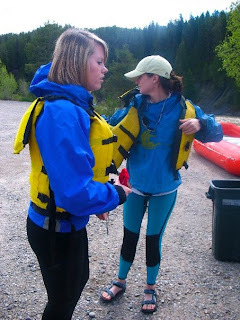 Next summer I'm coming back and I'm going to be a guide. I'm really wishing that is what I had done this summer!